I am reposting this one from late 2012 because it very much ties in with the theme of NY loft/club jazz in the 70s, although this specific one was later. There has been jubilation in jazz circles about the release, after 26 years, of a live recording by the Group at the Jazz Center of New York on 13 September 1986. The tapes had languished in Ahmed Abdullah's possession ever since until the Nobusiness record label out of Vilnius, Lithuania, was told about them and expressed an interest in releasing them. The cd (and an lp) is now out in limited circulation of 1000 copies so readers are advised to rush out and get a copy before it disappears. However, it is not the only recording in circulation. In the course of the short life of the Group, up to the end of 1987, they also gigged around the East Coast, including a date in Cambridge, Mass., on 21 January 1987. This is briefly mentioned in Abdullah's liner notes to the cd release. There is no mention of the gig being recorded, so this is in all likelihood an unofficial audience recording. Who was the Group? 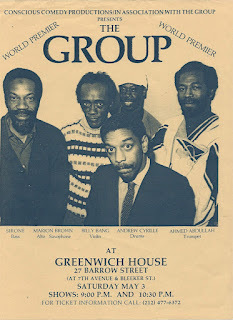 It was a collective composed of five members, some of whom had cut their teeth on the NY free jazz scene in the 60s (Brown, Cyrille) and others who had emerged as part of of the loft scene in the 70s (Bang, Sirone, Abdullah). After the loft scene had pretty much subsided, there was a scramble to look for new opportunities for players on a NY scene less hospitable to innovative jazz than before and to look for new collaborative models to work from. So, in that spirit, there was no leader of the Group and each member was encouraged to contribute their own compositions, even though the repertoire made room for covers of standards. As Abdullah writes, there have been several revivals of the Group, buth with the passing away of Brown, Bang, Sirone and also of Fred Hopkins (who is on the cd, though not on this gig), replacements have become a duty of necessity. In the pic above (a flyer for their very first appearance, courtesy of the Nobusiness website), all five members are present and these are the five you will hear on this Cambridge date. This is a historical recording of five great musicians. I'm not going to single out anyone in particular, though I would like to say that anything that has Marion Brown on it is pretty much essential. All five should be familar to followers of the blog (and parenthetically, I should try to find more from Abdullah). Two hours of goodness for y'all. Sounds like you're exhausted: "File owner's public traffic exhausted." Too bad. Would love to hear this. Never heard of this particular grouping of musicians. Anon and others: Please note that public traffic will be resumed at midnight European time. As this file set is rather large - close to 700 mb - the download cap of 50 gb is more quickly exhausted. In fact, those 50 gb were gone after about three hours. So, with a bit of patience, you'll get the files eventually. I uploaded the file to Crocko which reported that you would need to have a premium account to download it and that is of no use. Zippyshare does not accept files larger than 200 mb for free users which means that I would have to split the file into four parts to have it uploaded. More work for me, more work for you. So, folks, patience will be rewarded (eventually). All the best in the new year to you, too, mr. fish. This is fantastic, thanks a lot! Thnaks, K. It's set up on JDownloader which will be patient on my behalf! I was most pleased to see this group perform (in the Greenwich House concert shown in the poster)! A brilliant evening of music it was. This is worth waiting lots of time, beautiful line up, some sadly gone, a big surprise, thank you! Happy new year to all of you! I was thrilled enough by the No Business release of The Group. This extra performance is a total nugget. K - many thanks. @wos: Machines are infinitely patient, aren't they? @onx: The Nobusiness website has published the continuation of Abdullah's liner notes for the cd which takes the story from the end of the initial Group and up to the present date. A good read. I've uploaded the file to an alternative site. Let me know how it works. As it looks now, public traffic on RS will most likely exceed the 50 gb download cap today, but possibly taper off in the days to come. So much heart here, and I don't just mean in the music and musicians! What a way to bring in the new year. Thank you Kinabalu, and all other IS members, for all the hard work and enthusiasm that you have shared with us. Having now downloaded and listened, I thought I should add that this is a really remarkable recording. I was spell bound throughout. Best wishes for the new year to you, too, Igor, to all our followers and specifically to the chaps down under who are already in 2013 by now. Very nice present for the new coming year !! At last dwlded! Great group, wonderful musicians! surprisingly, having no RS problems now--everyone must be out partying or hung over! I'm having the same experience as Hideo. Must have hit the site just when the traffic turned over. Anyway, I'm thrilled to hear this recording. Thanks as always! Finally had a chance to listen to this one, and the sound is superb. Amazing recording. Thank you! A great posting! Realy fantastic.Thank you very much. Would You So Kind To Reup? Hi, Adrive link not working, can you please repost? Thanks in advance! Thanks, link is working now! But this Cambridge show is great!!! Have really enjoyed it. There are barely any recordings of these guys. Especially since they were a working band for almost 2 years. Anyone who didn't get this the first time around should definitely give this on a spin. This one is a gem!!!!! Wow! This looks just awesome!!! Thanks for the listen. Many thanks! and what a line-up!! Thanks for The Group. A big Marion Brown fan.